With the sad news that SpongeBob SquarePants creator Stephen Hillenburg has passed away at age 57, fans are remembering how the cartoon defined their childhoods — and later became a guiding star for meme culture. The series has remained relevant through two decades for countless reasons, not least of which is the immersive joy of its setting, the tiki-style underwater village known as Bikini Bottom, inhabited by a cast of instantly relatable sea creatures. But at the town’s heart, in a pineapple house, is SpongeBob himself, a relentlessly chipper yellow rectangle you can’t help but love. As a fry cook at the Krusty Krab, a local fast-foot joint, SpongeBob hardly fits the archetype of a manly hero. Ditzy, shrill and utterly lacking guile, he subverts our expectations of male protagonists going back to Odysseus. And that may be key to his enduring charm. Film critic A.O. Scott, reviewing The SpongeBob SquarePants Movie in 2004, found this a refreshing antidote to toxic masculine norms. “SpongeBob is weak, indecisive and easy to ridicule, but he is also loyal, decent and optimistic (and always neatly dressed) — a walking, singing reproof to the glowering, vengeance-seeking macho types who hog all the attention,” he wrote. The quest-like narrative, he observed, found SpongeBob repeatedly trying to prove his manhood, each time proving just the opposite. In one scene, he and his best friend, Patrick Star, wrongly believe themselves “invincible” after becoming “men” with the acquisition of seaweed mustaches. Unbound by traditional familial or romantic structures, the neighbors of Bikini Bottom are free to follow relationships wherever they may lead, with the eager-to-please SpongeBob — absorbent and infinitely malleable — well disposed to act on whims. One episode, “Rock-a-Bye Bivalve,” sees him and Patrick impulsively enter a domestic partnership in order to raise a baby scallop, with the dimwitted starfish claiming the role of a working “dad” while SpongeBob, the mom, is left to raise their child and sweat through household chores. The arrangement, idealized at first, crumbles as Patrick neglects his parental duties, and comes to a dramatic end when SpongeBob discovers that his “job” consists of watching TV while eating ice cream out of a briefcase. Luckily, the scallop is grown up by then, and their friendship can resume its platonic form. Shannon Brownlee, Associate Director of Cinema and Media Studies as well as a Gender and Women’s Studies professor at Nova Scotia’s Dalhousie University, takes the question of SpongeBob’s masculinity further still, concluding that the core tension of his world “offers a genuine challenge to the perceived naturalness of gender and of sexed bodies.” The movie in particular, she says, does not merely reject the usual notions of adult masculinity but estranges them. 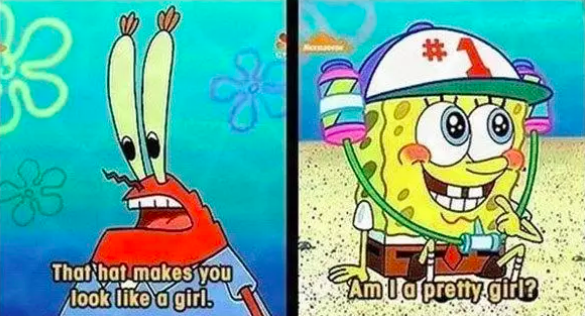 Just as SpongeBob is simultaneously man and boy — living independently, with a career of sorts, but playing and exploring with childlike innocence — his gender and sexuality are irreducible, all-encompassing. Moreover, it doesn’t matter. SpongeBob is SpongeBob, always one-of-a-kind and never a type. What does it say about his possible queerness that he knits Squidward a sweater made from eyelashes? Or that he gives Valentine’s Day cards to everyone, even the villainous Plankton, and not a specific crush? Whatever you want, of course. In any event, his happy-go-lucky behaviors add up to a guy of appropriate self-esteem, unembarrassed affection and everlasting buoyancy. The beauty of SpongeBob is that despite his adaptability, he does not — and cannot — change to suit those who resent his cheer and enthusiasm. That’s his value in a society pressuring young people to perform obsolete ideas of manliness and womanliness. This porous invertebrate exists in a place that tends to elide those icky binaries. It’s not that he doesn’t run afoul of them sometimes, whether that means petulance over Sandy Cheeks’ weightlifting prowess or demeaning his pet snail Gary in anti-feminist terms, yet the show serves these examples up as moments of absurd immaturity. Even in his failures, he models how narrow thinking chokes a sweet and curious spirit. It is a continued blessing — and Hillenberg’s great achievement — that SpongeBob’s shines out in the end.